Europe's new unmanned cargo ships will resupply the space station. Sometime during the last decade of the 19th century, French author and science fiction pioneer Jules Verne made handwritten note of the distances from Earth to several astronomical destinations, as well as the center of the planet. Verne, who by that time had already completed what would become his classics "De la Terre à la Lune" ("From the Earth to the Moon") and "Voyage au centre de la Terre" ("Journey to the Center of the Earth"), detailed the travel times for expeditions to the Moon, Sun and closest star whether going on foot, by train, or at the speed of light. Verne, who passed away in 1905, never lived to see any of his imagined voyages come true, but thanks to a new spacecraft bearing his name, his original notes will travel longer and farther than some of the times and distances documented by them. Whereas Verne estimated it would take nine months to cover the quarter of a million miles to the Moon by his fastest available mode of transportation, locomotive, the European Space Agency's Automated Transfer Vehicle (ATV) will cover that distance during its first day in orbit following its launch late Saturday evening on an Ariane rocket from Kourou, French Guiana. The ATV however, is not destined for the Moon. Europe's first spacecraft to launch and rendezvous with a crewed orbital outpost, Jules Verne is carrying 8 tons of wet and dry cargo for the International Space Station (ISS). It will spend about a week catching up with the ISS and then "park" about 1200 miles away to wait until after the space shuttle Endeavour comes and goes from its own mission before attempting its own autonomous docking. It is the first new spacecraft to join the fleet of U.S space shuttles, Russia's manned Soyuz and uncrewed Progress spacecraft that make station-bound flights. As a logistics vehicle, the ATV can loft almost three times the cargo as the Progress. The ATV's primary payload includes water, oxygen, food, clothing and propellant for the station and its crew, but it also has a few commemorative items to celebrate Jules Verne, both the man and the spacecraft named after him. "After having named the first ATV Jules Verne because of his visionary writings and the vehicle innovative design opening the doors to future European extraordinary voyages in space, we wanted to pay tribute to his inspirational work by flying on board this fantastic spaceship selected notes from his personal original notebooks," explained Jean-François Clervoy, ESA's ATV Senior Advisor Astronaut, in an e-mailed interview. "We chose two of his notes directly related to space travel, and selected also one of his own quotes that reflects well the vision of the European Space Agency: 'en avant'... ce doit être la devise de l'humanité!' ('let's charge forward'... it should be the motto of humankind! ')," wrote Clervoy, who has flown in space on three shuttle missions, most recently in 1999. According to Clervoy, the manuscripts and special quote are flying with a copy of "De la Terre à la Lune and Autour de la Lune" published during Verne's own lifetime. "When, after docking, the international space station crew will hold in their hands these original Jules Verne items, the first ATV will confirm that it deserves carrying the name of the famous French writer," concluded Clervoy. In addition to the manuscripts, the vehicle is also packed with 500 commemorative Jules Verne ATV mini-books and an Apple iPod pre-loaded with a special playlist of songs chosen by the winner of a student competition run by ESA in 2007. Norwegian Therese Miljeteig, 14, won for her top 10 list of musical selections chosen for their ability to "inspire and brighten" the space station astronauts' day. Her winning playlist included "Here Comes The Sun" by The Beatles, "Come Fly With Me" by Frank Sinatra and "Rocket Man" by Elton John. The judges, which included Clervoy, called Miljeteig's playlist "a wonderful mixture of songs that are 'out of this world.'" Jules Verne's manuscripts and the other commemorative items will return to Earth on a future manned return flight. 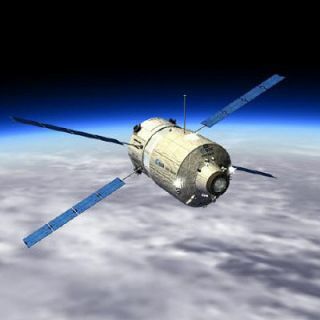 The ATV itself will remain at the station for approximately six months before being packed with refuse and allowed to fall apart and burn up while reentering the atmosphere. SPACE.com senior editor Tariq Malik contributed to this article from New York City. Visit collectSPACE.com for more photographs of Jules Verne's manuscripts and other commemorative items flying on Europe's first ATV.